Haiti does it again! 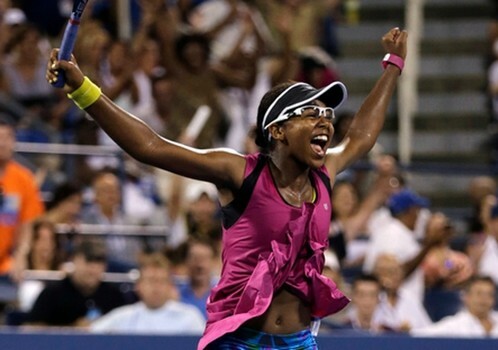 Seventeen-year-old, Vicky Duval, defied the odds to pull off the biggest upset of the 2013 U.S. Open with a come-from-behind victory against 2011 champion Samantha Stosur on Tuesday. At the surface, she lookst like a shy midget whose is anything but shy and weak. Going in to the tournament, she only ranked number 296. But tonight, Victoria ruled the world after winning her first Grand Slam win. It was a victory staging from behind after trailing by a set and a break at Louis Armstrong Stadium. All Haitians have a reason to feel empowered this evening. “When I first saw Vicky Duval play tennis in her first-round U.S. Open qualifying match last week, I was curious. Who was this young, Haitian-American 17-year-old with the sporty shades who was beating up on the No. 4 seed in the tournament, Teliana Pereira of Brazil?” admitted Andy Luse, a reporter for the Bleacher Report. In an interview with ESPN, Vicky said at first dancing was her passion, not tennis. She was a ballerina dancer until the age of 7. It was pure providence that tennis found her, and she responded positively. Her father used to take her to the Dominican Republic in tennis tournament. Her brother used to play, not her. When the coach asked her father to allow her to play, she agreed. She won the championship without ever practicing tennis before. The rest is history, as we’re witnessing it now. The stories of Victoria Duval, Nerlens Noel, Blake Griffin and others are tangible proofs that Haitian children are no different than other peers. Not only they can produce Dazzling results, they can also win the hearts and minds of people everywhere. I have always said that human intelligence is a country’s best natural resource. One wonders how better off Haiti could have been had the millions of Haitian children who have been deprived a decent education were given the opportunity to do so? Is she the next Serena Williams? Watch this short Vicky’s video from an interview with ESPN. Note: Dandy Isma is Psychology Major at University of North Florida. He lives in suburban Jacksonville. He is a sport commentator for CSMS Magazine.